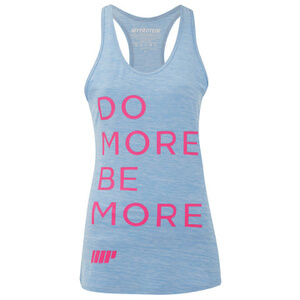 The Myprotein women’s stringer vest is a lightweight tank top that provides both comfort and style when training and working out. Crafted from a soft, combed cotton fabric for superior next-to-skin comfort and breathability. Designed in a tie-dye pattern, the sleeveless vest is cut in a fitted style for a streamlined construction and features a scooped neckline, a racer back and low cut armholes. Finished with a ‘Myprotein Fuel Your Ambition’ slogan across the chest. I want to update the review of this after using it for a month. It fitted well the first time. But it becomes very lose after washing and does not curve in at the waist any more! Not as good as my other vests. I just got this yesterday and cannot wait to wear it today! It's very soft and comfortable. I wear a pink sport bra inside that's only slightly darker than this pink. My husband said I good very good in this! It curves in along the waist and shows the waist line, which is not common among vests. I ordered medium and I usually wear size 4 or 6 for shirts (depending on chest size). This fits me well around chest, but very loose around waist. It's fine to be loose as it gives you enough room to do any movement.But I think I will order small next time.